In these days of wars, death, crime, and despair being experienced all around the world, finally we have become witness to a story of imaginable greatness and accomplishing what many thought was truly impossible. 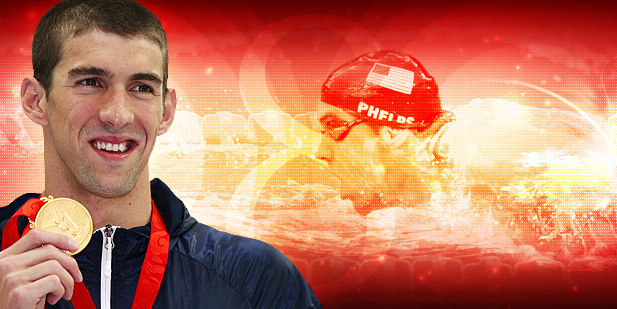 Michael Phelps, a young 23-year old swimmer from Baltimore, not only did he win at the Olympics, not only did he go on to break numorous world records, not only did he shatter Mark Spitz’s36-year old record of 7 gold medals, he captivated the World with his everlasting endurance and fortitude and his inability to give up on his dream. This is ranked by many as the single-greatest feat ever accomplished, and in my opinion he now has proved himself worthy of being considered the single greatest athlete…..EVER! The most decorated Olympian ever, 8 gold medals in the 2008 Olympic games, numorous world championships, etc, etc….and still more to come. There are so many good articles out there right now and I urge America to soak this in. Like I said before, with so much heartache, destruction, and pain right now in the world we as Americans, and world behind us, and stand up and soak this story in. The story of an impossible feat, becoming possible, through hardwork and following your dream. Thank you Michael Phelps for helping people believe, and giving them a reason to stand up and cheer, when so many people struggle to find reasons not to cry. This entry was posted on August 17, 2008 at 12:54 am and filed under Sports. You can follow any responses to this entry through the RSS feed.